The No. 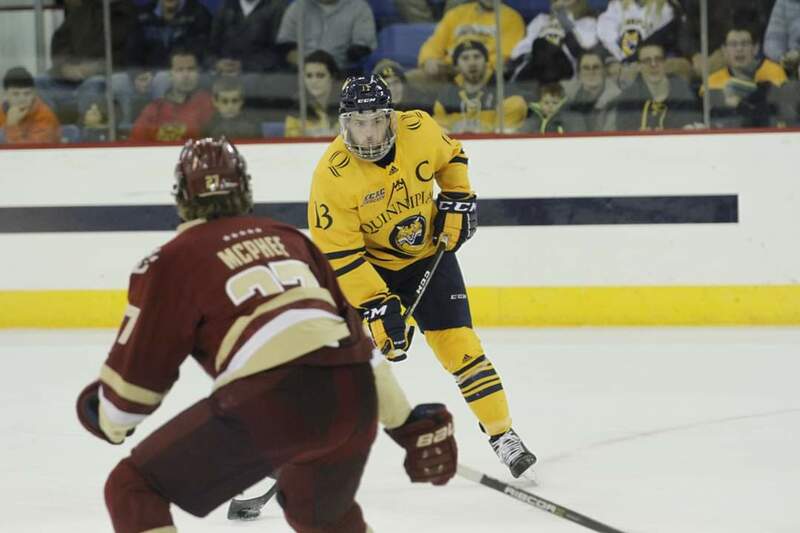 9 Quinnipiac Bobcats (11-2-0, 4,2 ECAC) look to extend their 1st place lead this weekend against the No. 19 Princeton Tigers (3-4-1, 3-2-1 ECAC). Quinnipiac is riding a 4-game win streak, while Princeton is looking to snap a 3-game skid. Tufto is coming off a career weekend in which he had six points against Maine, including a hat trick in the Bobcats’ 7-2 romping of the Blackbears last Friday. A sophomore from Chaska, Minnesota, Tufto is leading the team with 9 goals and 18 points. Tufto has emerged as a young leader on offense and will look to continue his dominance this weekend. It is no secret that a losing streak is usually caused by a struggling defense. During the past three games, the Tigers have been outscored 9 -3, while Quinnipiac has outscored their opponents 14-2. Ferland needs to help get his defense in order if Princeton wants to improve their national and conference standing. Quinnipiac has been exploding on offense over the past two weeks and if Princeton wants to come away with an upset, they will need to play air-tight defense, and that starts with Ferland. Quinnipiac is heavily favored to win this game. However, Princeton has had its share of dominating offensive performances, including 4 straight games with at least 4 goals. The Bobcat’s young team will have to lock up on defense. Coach Rand Pecknold has started Keith Petruzzelli and Andrew Shortridge in goal this year and it will be interesting to see if Pecknold goes with the more reliable Petruzzelli, or the upperclassman, Shortridge. Princeton runs a very fast offense. They are quick to the puck, which usually results in not enough help surrounding the play. If the Tigers want to break this red-hot Quinnipiac defense, they are going to have to try some more finesse, and less aggression. Fun Fact: Coach Rand Pecknold is 2nd all time in wins (496) by a head coach at Quinnipiac University history, and is only 4 wins away from 500 career. If all goes according to plan, Pecknold will be celebrating this legacy-cementing feat at UMass Amherst next weekend.